Interest was growing in Buckingham County’s fight against saloons. The Drys Putting Up Fight in Buckingham. Fourth of July to Be Celebrated.
. . . Mr. J.W. West, field secretary of the Anti-Saloon League of Virginia, has been in the district a week, speaking in churches, halls and on roadsides to large audiences of people, and has so enthused the temperance element that they claim certain victory on July 11th, when the election takes place. On election day the young ladies of Arvonia, belonging principally to the Presbyterian and Baptist churches, will go to New Canton, the voting precinct, in a body, floating a banner and wearing streamer anti-saloon badges. They have secured a house and ground on the principal street in New Canton, and will there serve refreshments, such as ice cream, fruits, coffee, etc. to the friends of the temperance movement. It is understood that the ladies at Gold Hill, the other voting precinct, will proceed along similar lines. 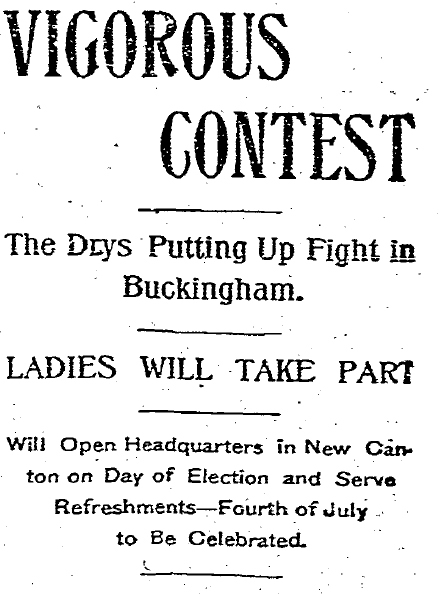 The ladies of Buckingham County may not have secured the vote; however, they knew they were not without influence. Especially the pretty young ladies of Arvonia!